The film version of Richard Gordon's hilarious sequel to Doctor In The House. 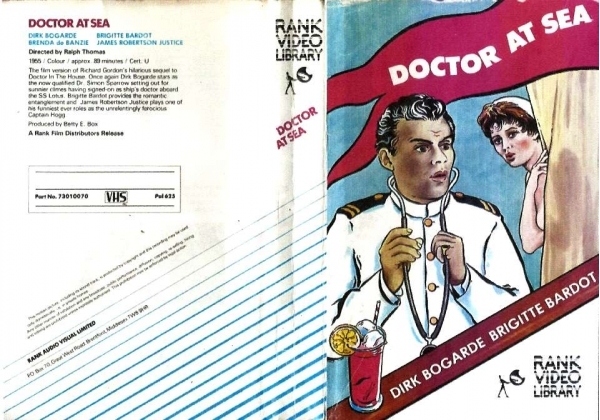 Once again Dirk Bogarde stars as the now qualified Dr. Simon Sparrow setting out for sunnier climes having signed-on as ship's doctor aboard the SS Lotus. Brigitte Bardot provides the romantic entanglement and James Robertson Justice plays one of his funniest ever roles as the unrelentingly ferocious Captain Hogg. Or find "Doctor at Sea (1955)" on VHS and DVD / BluRay at Amazon.